Chelsea are the proud owners of a very impressive Premier League record following their 4-1 victory against Cardiff yesterday afternoon. Chelsea have now won their opening 5 games of the Premier League season on five different occasions. Chelsea have won their opening 5? games of a Premier League season on 4? occasions – more than any other team. 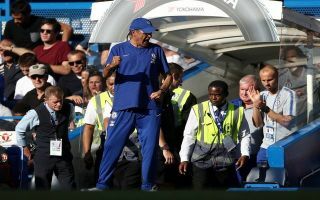 Chelsea’s impressive start to the season leaves them sitting in 1st place in the Premier League, it is truly remarkable that the side are performing so well so early in new manager Maurizio Sarri’s tenure. The appointment of the Italian has massively lifted the spirits of the players and fans alike. Sarri seems to have turned around the morale of wantaway stars such as David Luiz, Eden Hazard and Willian. Luiz spent most of last season watching the Blues from the sidelines after being banished from the first team by then manager Antonio Conte. On the Eden Hazard front, the Belgian winger looks like he has a new lease of life returning to the kind of form that cements him as one of the most talented players in not just the Premier League but the entire world. Superstar Hazard has scored 5 goals and added 2 assists in only 5 appearances this season should the 27-year-old’s man of the match performances continue he will be nailed on to be named the Player of The Season. After yesterday's victory over Huddersfield, @ChelseaFC have already put together a longer winning streak this season (five wins) than they managed throughout the whole of last season (four wins). Thought Chelsea would experience teething issues under Sarri—mostly defensive—and while there are still problems and Luiz is still doing Luiz things, it’s going incredibly well. Jorginho the most important signing they could make, while Hazard is just cracking teams open. Chelsea could well lift the Premier League title come the end of the season thanks to their resurgence under Italian mastermind Sarri.